Yummy! Salisbury steaks, with onion and mushroom gravy–and just in time for autumn! My new favorite meat is ground turkey. It’s so versatile and so savory and delicious. It’s moist, too. And for you out there trying to save a few calories, it’s slightly less caloric than ground beef. Tip: Skip the cream cheese to save calories. I use it since it has gums, which help thicken the sauce. You could also add heavy cream instead. To make these fun oval shapes, I use an oval-shaped ramekin. I spray the ramekin, press in the meat and then tap the ramekin against my hand, face-down to release. I then place the patties on a square of waxed paper or parchment until ready to cook. I also use a hamburger press/weight to help brown the patties while they cook. I think they’re even prettier when the edges are colorful. You could use a clean brick wrapped in foil s a weight, too! 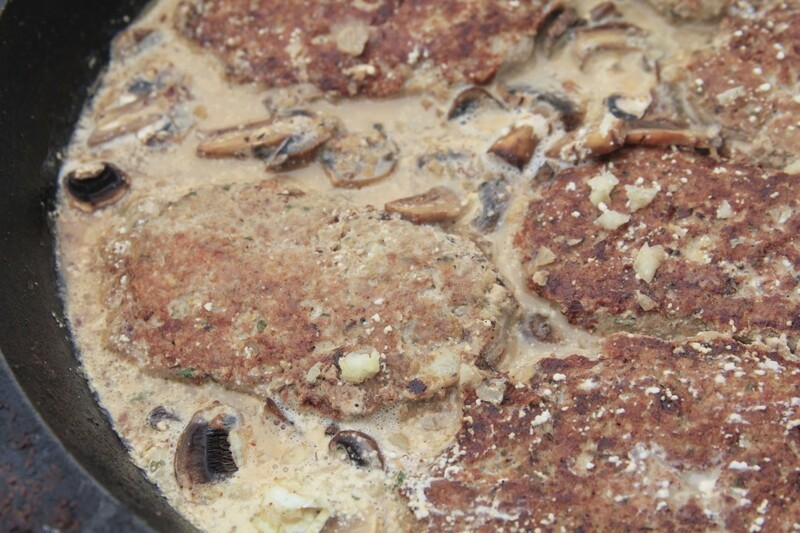 Of course, weighing down isn’t as important; it’s just a nice touch..
Salisbury steaks in delicious, thick gravy. Tip: Prefer beef? Simply swap out turkey for ground beef and chicken broth for organic beef broth. This recipe is literally so wonderful, my husband ate five of the patties in 24 hours. I got one, thankfully! I know I am going to have to make this dish again. 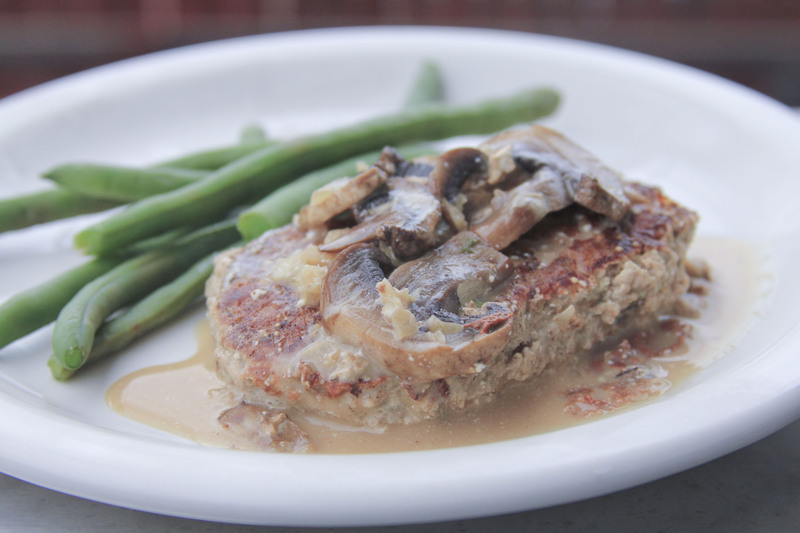 As we move towards Thanksgiving, these Salisbury steaks are also a fun way to make a turkey dinner without the carving and the fuss. At only 260 calories and 2.7 net carbs per generous serving, you can also pack these for lunches, freeze them and make plenty ahead for later. Have a crock pot? Make these patties ahead and simmer in the gravy on low heat until saucy and delicious. Tip: You can skip microwaving the cream cheese with the broth, but it gets the gravy to temperature faster. Love this recipe? Please let me know. I love hearing from you. Heat a large frying pan with oil pan over medium heat. In a mixing bowl, combine ground turkey, egg, flax seed meal, pepper and salt. Form into 6 oval patties (I used a greased oval ramekin). Cook for 5 minutes per side, or until browned. Remove to a plate and cover to keep warm. In a glass measuring cup, combine broth with cream cheese. Microwave for 2 minutes. Stir to combine. Add to mushrooms and onion in the pan. Let boil and then reduce heat to a simmer for 5-15 minutes or until thickened. * Serve over steaks. *Do the kids hate mushrooms and onions? Pour the gravy into a blender to remove any physical traces of the veggies, and you can still enjoy the flavor and the thickness. Makes 6 patties with gravy. Love, love, love your bog! Could you use ground beef instead of turkey? Thank you so much, Eimile! You certainly can use beef. In that case, I’d switch out the organic chicken broth for organic beef broth. Superb recipe, thanks Jamie! We will not have any ground turkey until after Thanksgiving which is Oct 8th. Breakfast…I was out of eggs….or horror of horrors….so I fired up a tuna melt! Green tea. I would love to run out for eggs right now….however, fall has hit and it is only 42F…whilst it was 79 F only 48 shorthand hours ago! So…lunch will be eggs…and my favourite…..bacon! And more green tea! Dinner will be your Chicken Salisbury Streak! It sounds wonderful! I have never thought of a gravy like this…..thanks for being the ultimate teacher! This is just great! Where would we be without you? Gladys, you would be rocking it out with or without me; I feel like I’m the lucky one getting to share with everyone and having you share back.So many people just don’t have that support circle, so I’m always excited to have that. I AM the fortunate one to have found you once more…I had discovered you years ago under cleochatra! I have learned so much this year…I now realize that what I USED to do as low carb was not true and just! It was MY kind of modification of what I wanted low carb to be! YOU have taught me how to eat….and your luscious desserts keep us on track…whether we make the treats or not, for me knowing I CAN at anytime …prevents cravings! Plus the bacon and eggs….I do best with bacon…..eggs are just not filling enough! WE are all members of your team! We are the personification of improved health! You have made my whole morning. Seriously! Thank you so much for always taking the time to share. I am like you; knowing these foods exist keeps me on track. I tend not to want what I can have. It’s knowing that that I don’t feel like I need to jump off of the wagon. EXACTLY…knowing we can have all the goodies…we don’t…. It is the ultimate mind game! I hope you love it as much as we do! I love using cream cheese as a thickener because of the gums. It’s hard and expensive to find gums; cream cheese is easier to find. Growing up salisbury steak was always one of my favorites. Thanks for a great simple recipe idea, especially the easy sauce where I tend to come up short on flavor. The flavor of this recipe is so nice, and it’s so simple. 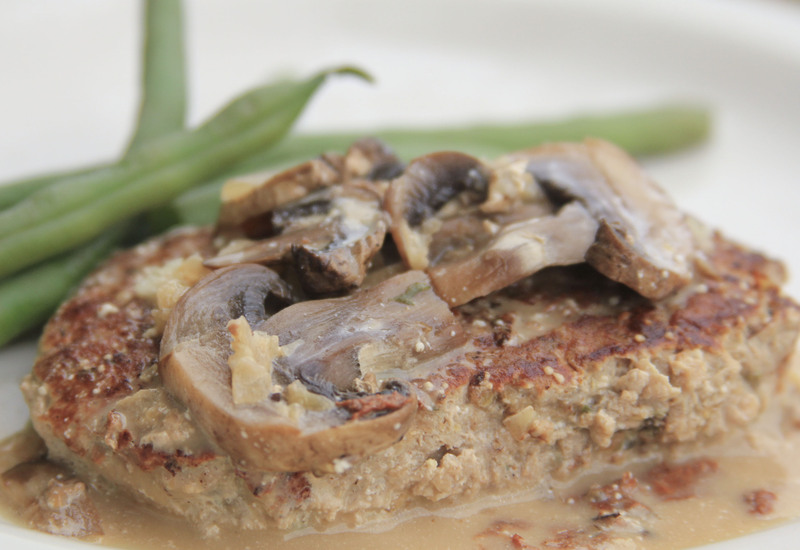 The gravy, mushrooms, onions and the thinness of the patties makes for a delicious, flavorful meal…and the turkey is so delicious and moist! Do you think I could mix up the meats and put in muffin tins like a mini meatloaf? How long would you could it for? Deanne– I don’t see why not. I would probably bake those for at least 20 minutes at 350 degrees Fahrenheit. Then make the gravy on the stove and serve either as a dipping sauce or served over the mini meatloaves. You could also make these into meatballs. Hi, Alisa! I hope you love them as much as we do. It’s so like Thanksgiving, minus the carb coma. You hit the nail on the head. When I can’t have something (a partcular food) then I want it even more. So your goodies and wonderful meals keep me happy, happy, happy! Friends of mine look at me and feel sorry for me for my way of eating. I just look at them in shock, like you have no idea what I eat, cookies, pies, wonderful meals that I come away stuffed from, REAL butter (you know how many years it had been since I had real butter? Many! Oh and let’s not forget the bacon (how could I???). Oh my goodness, and feel sorry for me eating all this and losing weight? Are you kidding? Thank you, Jamie, hugs! Can’t wait to try this. Looks so simple and so good. I love that you do that with the mushrooms! I need to do it, too, more often. I think it’s such a neat, meaty way to thicken sauces. I am so glad you liked this recipe and took the time to let me know. You are phenomenal! I totally read that first part wrong. I read, “I spray the ramekin, press in the meat and then tap the ramekin against my HEAD, face-down to release.” Bwhahahaha, oh the imagery!! Well, that would explain my lapses in memory anyway! Hi Jamie I havebeen following your post and all the other readers comments. You have motivated to gt back in shape. Hopefully by the end of the year. I am following Adkins and am losing well. I am confined to wheechair and I’m on oxygen so I don’t do much exercise. I got the video “armchair exercise” and trying that. Anyway want to say thanks for being my inspiration. Judy, you need to take baby steps, and they all matter. I am really proud of you for doing what you can with your current situation! You are an inspiration! This looks fab!!! I may do this tomorrow night, I just need the shrooms!! But they will meet my Ninja!! I love the taste mushrooms give a dish, but I can’t stand to bite into one!! To me, it’s like chewing a rubber band! I have been remiss in posting my weight loss. I am down 17.2 pound since the start of the mid-summer resolution and 29.5 pounds since I started low carbing about 3 months ago!!! I feel so much better!! I have a question for you, though, do you use Dreamfields? What do you think of it? You are doing so well. Woohoo! I am seriously psyched for you. I like Dreamfields and it hasn’t affected my family negatively, so we use it at least once a week. Here’s my review of the product: https://yourlighterside.com/review-dreamfields-pasta-2/ I hope this helps! I made this tonight as a loose SOS (without the shingle) kind of dish and my kiddos gobbled it up. Thanks for sharing all of your fun recipes! That sounds really delicious. Yeah, Mom! And thanks so much for your kind words. I am so happy you gave this recipe a try! I really love it, but I know it probably seems weird to a lot of people who have always had the beef version. Turkey is such a nice, tender option. Thank you so much for this recipe. I’m always looking for options that use lean ground turkey. So great to have a yummy gravy that is gluten free. My kids loved it, even the mushrooms. The mushroom gravy was a hit with the whole family. You are a super creative chef ! You are so kind! I am thrilled that everyone loves this recipe! It is so much fun to make. I love turkey! I was wondering if the broth and cream cheese mixture could be used to deglaze a pan of any panfried meat – say chicken thighs – and whether it would thicken with fewer onions and mushrooms? By the way, thanks to this site I have lost 19 lbs. I credit you and your cheesecake for this success!